Low Functioning? High Functioning? What Are We Really Saying? This guest post is written by Mary Louise Betram. Ms. Betram is an educator has specialized in Angelman Syndrome other learners with Complex Communication Needs (CNN). She presents and consults internationally on Angelman Syndrome, learners with complex communication needs and literacy. about the WHOLE child, and I'm ALL about looking at the child as a whole person. "Complex Communication Needs" (CCN) tells me a lot about the child I am about to meet, "Cerebral Palsy" gives me an idea about any movement or motor planning difficulties and I can keep this in the back of my mind during my dynamic assessment. "Autism Spectrum Disorder" (ASD) gives me clues though I still have no idea or judgments about the particular child I am about to encounter. "Angelman syndrome" (AS) tells me a lot, though I know the "Google version" is very different to the reality. "Low functioning" tells me nothing and gives me no clues EXCEPT to tell me about the adults who work with the child. When I read or am told that this child is "low functioning" it tells me right away that the adults in this child's life have not done enough problem solving to discover what supports the child needs in order for him or her to be successful. Calling a child "low functioning" is, to me, actually an adult saying "He's too tricky, we have no idea what he needs and when he needs it". Children who are labeled 'high functioning' are the kids who are relatively easily to problem solve. These are the kids that make it more obvious what supports they need in order to be successful. Child trying to hold a pen and is scribbling letters? 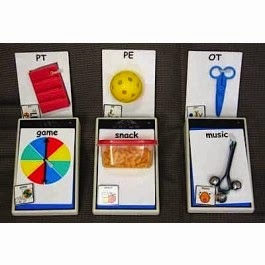 Easy to problem solve - fine motor supports, handwriting supports, OT, keyboarding. Done. Child with ASD and CCN who demonstrates he can navigate an iPad like an Apple Genius? Relatively simple AAC assessment resulting in dedicated device being prescribed. Verbal child with CP who attends mainstream school and is academically at grade level but has anxiety and stress during transitions? 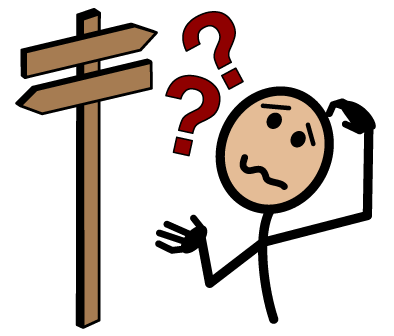 Ask child what is stressful and see what they say, develop a plan preparing for transitions, a consistent language to guide child through transitions, and enable child to have an element of control during transitions. Kids who are called "high functioning" are the ones who are the easier ones to problem solve. "High functioning" has nothing to do with them, it's all about us and how we see them and their needs. Every single one of us has the potential to be "low functioning" if we do not have the supports we need in order to be successful. If you need strong glasses for reading and you forget them on the day you need to drive to a client in the Woop Woop (Boondocks) and you can't read the road directory (map) you are going to be pretty low functioning and have to ask for a lot of help. If you always do the weekly supermarket shopping with a list and you leave the list at home one week, the week when relatives are visiting and some have random allergies and you can't remember what they are, you are going to appear quite low functioning as you slowly walk around the store, stopping to rack your memory about what you need, and you will probably make a lot of mistakes and come home with the wrong things. We all need supports in order to be successful. If the criteria for being a "high functioning" husband was related to his fine motor abilities when packing the dishwasher and folding the washing, and brushing the kids' hair and making even ponytails, then many husbands I know would be labeled low functioning. That label wouldn't tell me about that husband's incredible cooking capabilities, or his ability to create whimsical bedtime stories for his kids. The label doesn't tell me about that husband as a whole person. I can cook a mean scrambled eggs on toast. I am a "High Functioning" Domestic Goddess when I have had a proper sleep and no travel. Ask me to make scrambled eggs when I get home to Perth (Australia) from Los Angeles (USA) and it is a different story. I will most likely drop an egg, there will be eggshell in the scramble, and I will probably be unable to string a coherent sentence together and I will most probably be crying from my jet-lag. Anyone walking in could label me low functioning. I would also appear extremely low functioning if I was asked to cook 400 servings of scrambled eggs in the Sheraton Kitchen on a busy Sunday with 25 chefs running around doing their jobs and all looking incredible high functioning. I am very high functioning in terms of language, comprehension, and I can navigate myself around many cities very well. However, if you dropped me into the center of Baghdad I would present as low functioning. I would be terrified, unable to understand the language or communicate in a language people around me would readily understand, and I would be unaware of the expectations and of the consequences of my actions, even small actions such as how I walked or how I approached someone. I would be overwhelmed by sensory input - sights, smells, sounds. I would be a mess. 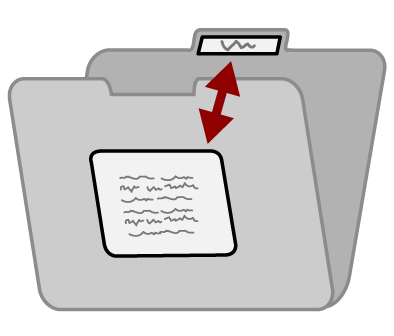 that had briefed me beforehand, gave me access to language I could use and understand, explained to me exactly what I would see, what I was to do, and how I was to do it then I could appear quite high functioning. If I had the supports I needed to enable me to be successful, even in just making it from the helicopter drop point to the base, I could be seen by observers to be quite high functioning. It is ALL about the supports. Baghdad. Without a military briefing, without a map, without understanding the purpose for being there, unable to understand or process the language and with no way of asking for help. How cruel of us to do that to children. 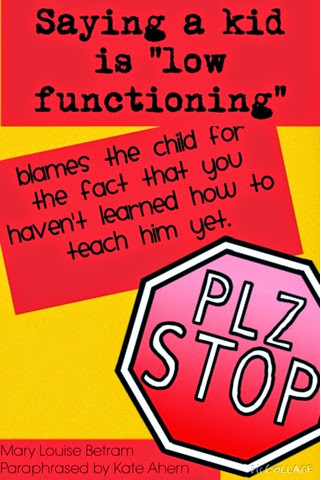 Children who are labeled "low functioning" are the kids who are the tricky ones to problem solve. They don't, "throw you any bones". They are often consistently inconsistent and the supports that work one day just don't work the next. These are the kids that need the strongest supports from aided language stimulation, a robust full language AAC systems, alternative pencils, visual supports, sensory strategies, and an engaging curriculum. If we just say, "well, he's low functioning, so that's why he can't do xyz" then it is OUR fault he cannot do xyz. What do the adults need to do in order for the child to at least have access to be successful at even trying to do xyz? fault because the adults in her life have essentially told her to stop bothering, to give up. Let's look at what Hannah needs to be able to do and then let's think BIG about how we can support her to be successful doing it." It is about US, not the children. We are the adults and, frankly, we are paid to support these children to be successful. 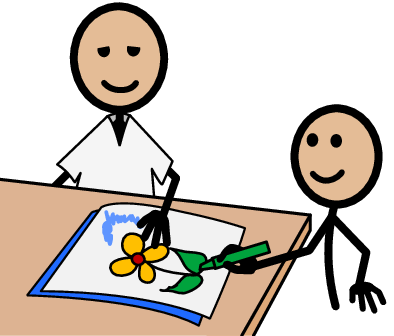 If a child labeled "Low Functioning" has Cortical Vision Impairment (CVI) and nobody on his team has any idea about what that is then the likelihood of that child being able to use his vision successfully, and to improve his vision in that class, are slim to none, and people will still see that child as 'low functioning'. When staff learn about CVI and relate that information to their student suddenly they can see that child as strategic in his movements and in his use of vision. Suddenly that child appears quite "clever" and "high functioning". Suddenly the child is able to see things. Suddenly that child is able to demonstrate his knowledge. Did the child magically change overnight into a "high functioning" person with cerebral palsy? Nope. What did change was the knowledge, expectations, and skills of the adults. The adult now understand and implement the best support for the child and "suddenly" the child could engage with the lessons. It is not about the children. It is about us and the supports we provide. I am not expecting that any person on the teams that I consult with become an expert in Angelman Syndrome, Complex Communication Needs, Epilepsy, medications, CVI, apraxia, dyspraxia, AAC, PODD, or Aided Language Input. I AM expecting the team to have an understanding of how these things apply to their student and how they can use this knowledge to enable their student to be successful. I AM expecting the team to problem solve. There are many children who appear "high functioning" in some environments and "low functioning"
in others. Rather than just saying, "Jack loves art class so that's why he behaves and does his work properly" we need to look at what is it about art class that supports Jack to be successful there. What is it about art class that is missing in his other classes. How are classes where he cannot cope and where his challenging behaviours and communication frustrations are most evident different from art? Often it is not simply because, "Jack loves art". It can be the expectations of the teacher, the way the teacher explains things, the visual supports and gestures she naturally uses as she teaches. It may be where he sits in the art room, the acoustics of the room, or the lighting. We owe it to the child to critically analyze what is it about the art class that works for Jack and how can we put those supports into other areas in his life so that he can be successful there too? I hope more and more professionals stop using the terms "low functioning' and "high functioning" and that more parents and professionals are empowered to talk about the damage these labels can cause. 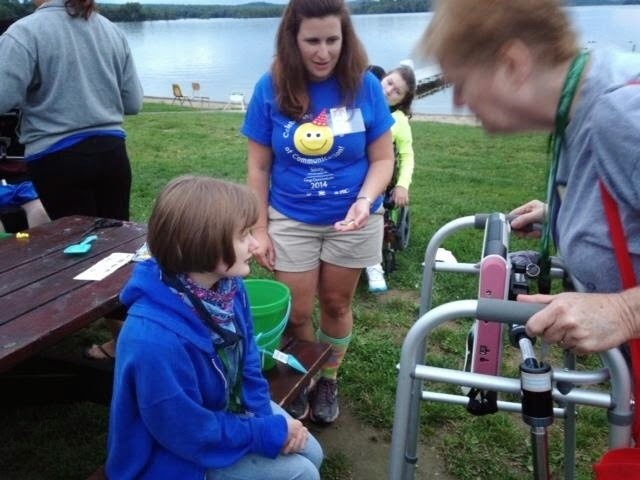 At the beginning of my presentations and workshops I talk about two of the adults with Angelman that I work. Peter is in his early twenties, is not fully toilet trained, lives with other men, has many challenging behaviours, especially around food. 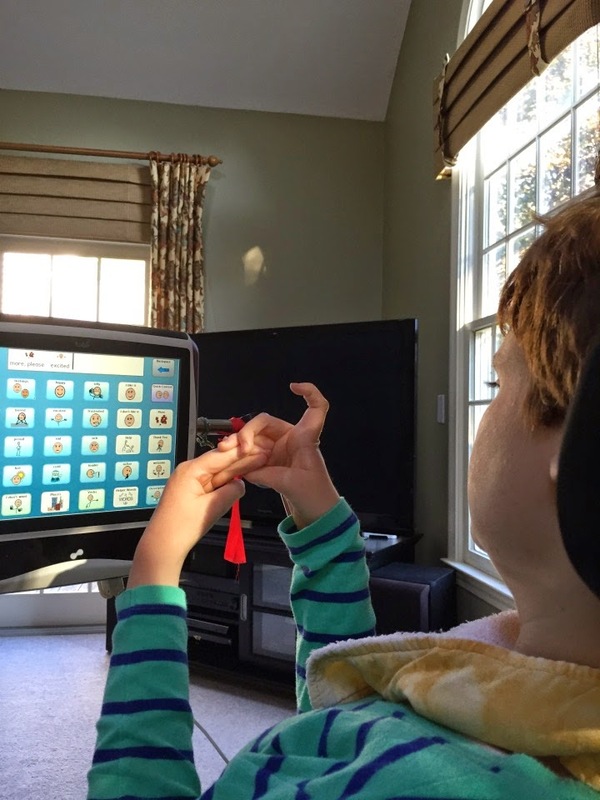 Peter uses some AAC, sign, gesture, and loud vocalisations. Peter loves trains and cake. Peter likes to destroy computers, televisions, and other electronics. I then show some photos of Peter. People look at Peter surrounded by food and broken computers and they say 'Yup, he has Angelman'. People comment, "he's probably deletion" (what is often considered to be the more severe form of Angelman) and "I've had low functioning students with Angelman like that at my school". he is studying a certificate in Music. Bob plays the drums, composes music using composition software on the Mac. 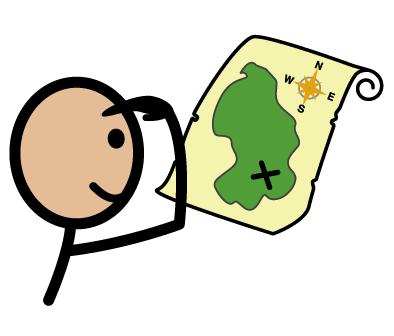 Bob uses a 70 per page PODD book and the 60 cell PODD Pageset on the iPad Compass App. Bob has a girlfriend who he loves dearly. He has always been included in mainstream schools and lives with his mates that he has known since childhood. Bob has his own business and presents to University Business students about his business and his life. Bob attends literacy classes to improve his literacy. People say "are you sure he has Angelman?" and "He must be ube3a or ICD. 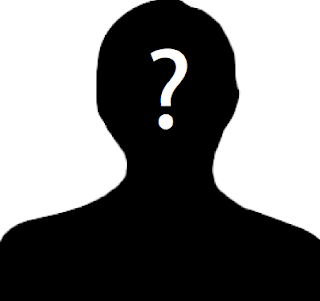 Maybe he's Mosaic?" and "Wow, he's so high functioning". I then show some photos of Bob. They are the same photos as Peter. Bob and Peter are the same person. How we talk about someone matters. Reprinted with permission and slight modifications. Let's do a thought experiment. You'll come along for this journey with me won't you? Imagine that your classroom receives a new student. She's 7 and has been home-schooled until now, no formal education at all. Her parents report that she developed normally until around 20 months. At which time she became very ill and developed multiple disabilities. The audiologist reports that she has no hearing (based on an evoked auditory potential test done under sedation) and the neurologist has provided a report saying she will not recover vision and that she is untestable using standard measures. Additionally, she has significant behavioral challenges and she appears to have a cognitive or intellectual disability. When a home visit is completed the child is noted to move throughout the house destroying property and at times having behavioral meltdowns where she is aggressive. She is unable to participate in class at all when she comes to school and does not appear to attend to adapted materials when you present them. It's fallen to you to develop an IEP. You bring in the team to complete assessments and make recommendations. The behaviorist at your school completes a functional behavior analysis and determined that the child is acting out to receive tangible items and to avoid demands. She's completed a preference assessment and determined a few sensory experiences that will be rewarding. She lays out a plan to increase sitting at the table with her peers and to decrease aggressive outbursts. recommend OT. However, she suggests a sensory diet and frequent sensory breaks. The physical therapist finds no need for PT services. for actual items. The TVI also suggests you make a modified "little room" with plenty of tactile and olfactory stimuli. The teacher of the hearing impaired comes in and teaches you and your staff two dozen keyword signs and shows you how to do hand under hand signing. You learn the signs to go with the object symbols that you will be working on. You all work together with the behaviorist so that you can cue transitions using these keywords signs and the object simple cards. up other sensory experiences to be run by switch. 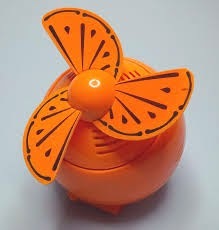 You have a foot bath and a special aroma fan. The behaviorist is working these things into her positive behavior support plan. Your paraprofessionals are feeling ill prepared to deal with your new student. They're worried about her aggressive behavior. You have requested a one-to-one aide and one is brought in and trained and certified in de-escalation and restraints. She will be with your new student all day. You are a little worried about the number of adults in your classroom now. You do have six other students who have wheelchairs and equipment and there is a lot of feeding and changing to do. You were worried you will not be able to address the core curriculum as demanded by the state with so much to do and so many people to manage. Can you imagine all of this? Can you picture it happening in your classroom or your school? Do you know who the student is? The student is Helen Keller. Can you imagine what would happen if Helen Keller arrived in one of our classrooms today? Can you imagine what the world would be without Helen Keller because that is what you need to imagine when you think of this scenario. Our thought experiment leads us to understand that if any child with the capacity of Helen Keller and the disabilities that Helen Keller had were arrive in nearly any special education setting in the United States and possibly abroad her intellect and talent would be wasted. If Helen Keller was a student today what would happen when we took the behavioral and sensory approach that we nearly always take? What would happen if we failed to presume competence and fell back on our hierarchies and prerequisites? 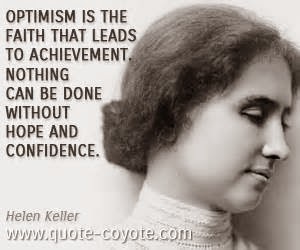 Luckily, Helen Keller was not educated using behavioral and sensory interventions. She was educated using a presumption of competence; a belief that she could and would learn and was provided with intensive aided language stimulation. That is not what it was called then, but that is what we would call it now. Annie Sullivan spoke to Helen Keller in the language that Helen Keller would then learn to use for the rest of her life. Think about that. She spoke to Helen USING the language she expected Helen to learn to use. We know, for a fact, that Helen Keller succeeded because Annie Sullivan presumed competence and dedicated every waking minute to teaching Helen a robust language system. Helen Keller wasn't given a choice between two objects. She wasn't forced to touch an object symbol that was supposed to mean "more" for every bite of food. She wasn't pushed through a (false) hierarchy of symbolic representation. No one ever said that sign language wasn't transparent enough or that she had to prove herself with three signs before she could be exposed to 16 signs. 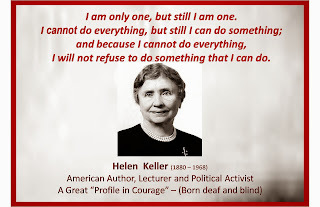 Helen Keller succeeded precisely because Annie Sullivan did not do what we do now. 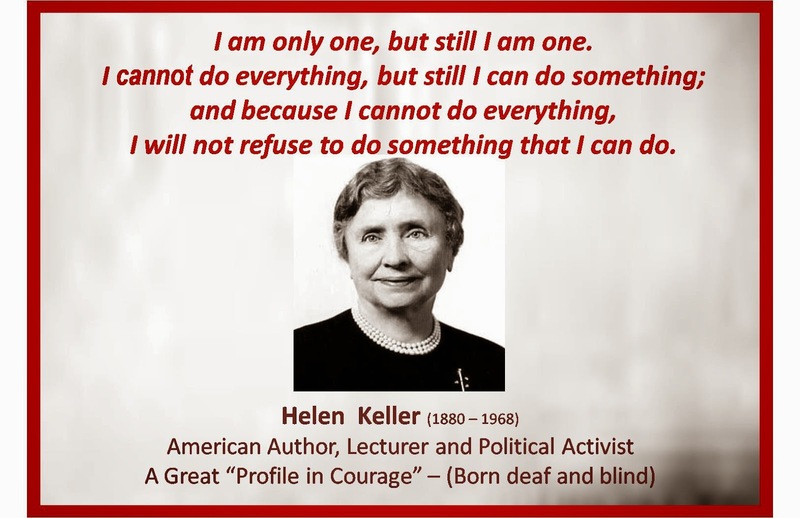 Helen Keller succeeded because Annie Sullivan believed in her and gave her the gift of language without testing to find out if she was capable of learning that language first. 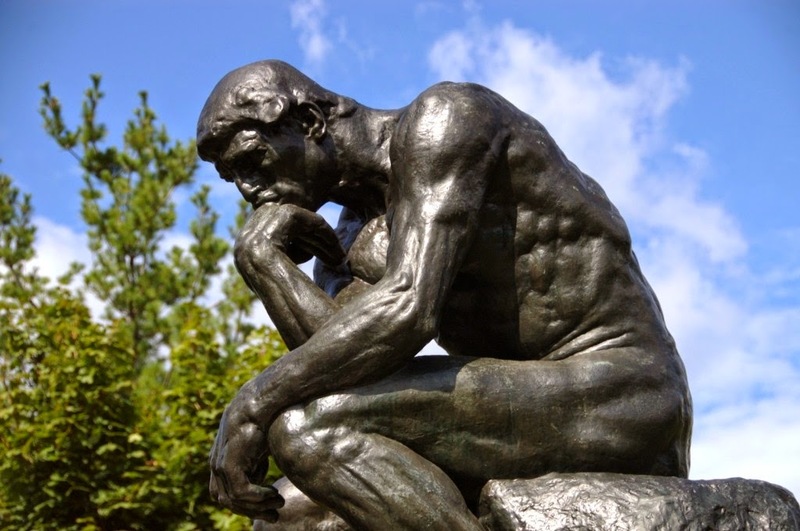 What do you make of our thought experiment? What I make of it is that we cannot judge our student's future accomplishments based on first impressions. We must, MUST, presume competence and believe that our students can learn. We must treat every "untestable" child as if she has the intellect of Helen Keller. We really have no other choice. 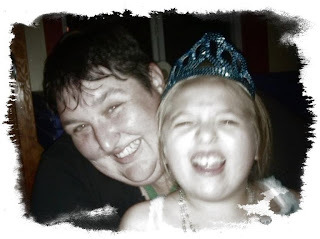 Samantha, a sixteen year old who has Rett Syndrome is not the first teenager with significant special needs I have worked with who has accomplished basic literacy, and I know she will not be the last. I believe that literacy is a life skill and a human right. I've featured Samantha as she has learned to read on this blog twice. Recently I have been asked how it was she learned to read and if we followed any curriculum. This goes without saying, but presuming competence and believing that Samantha could and would learn to communicate and read was the first step. She needed to be reminded constantly that though she battled Rett Syndrome taking away use of her hands, dystonia forcing her eyes up and head back and seizures that interrupted everything she was smart and could learn to read. Being a augmentative communication user with a robust communication system has the added benefit of automatically creating a print rich environment. 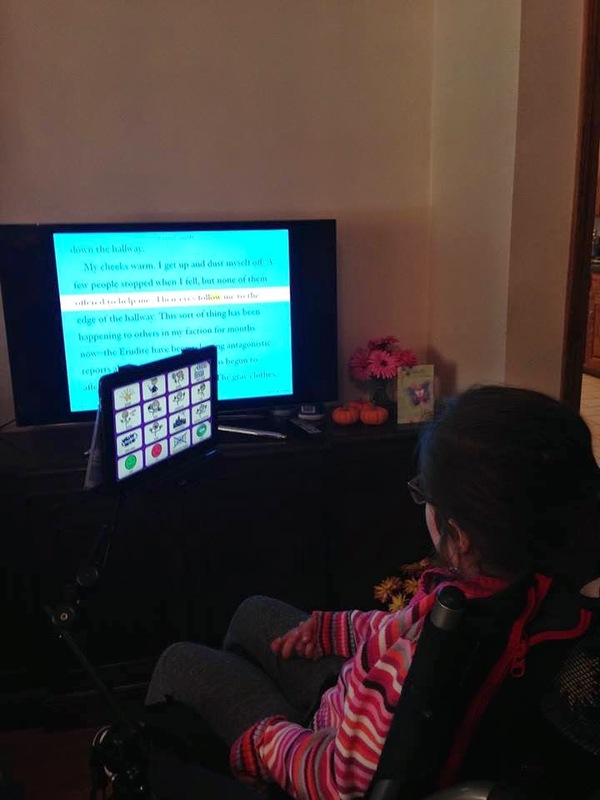 Once Samantha moved to a robust system of language on her Tobii (a combination of custom boards and Sonoflex) she had print in front of her nearly every waking moment. She has access to letters through typing pages on her device. 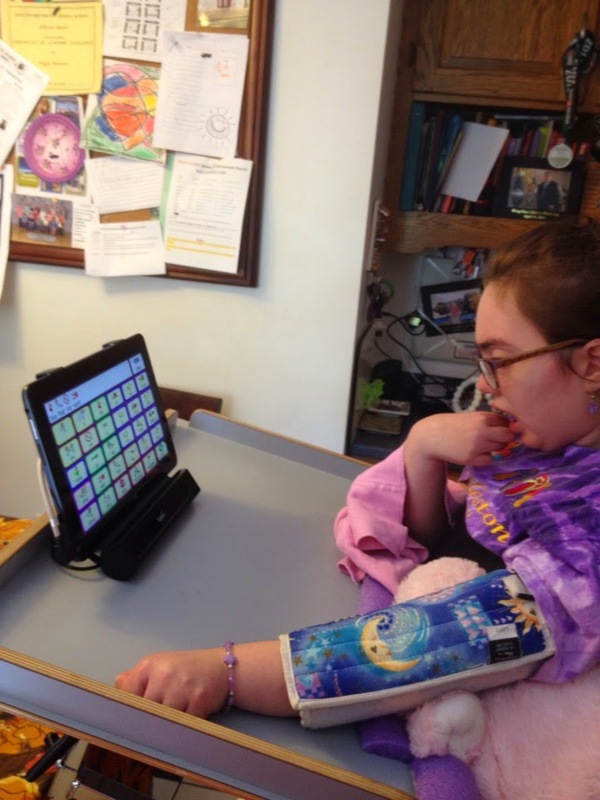 As her family and school committed to constant aided language input on her AAC system they frequently modeled how to go to the typing page and sound out words that could not be easily found in her system. Samantha has also always loved books. She loves picture books and age respectful books (she is currently reading Divergent using Bookshare and the Voice Dream Reader App projected to her TV with Apple TV). She loves being read to and reading along. She also loves the Reading A-Z app. This life long exposure to and engagement with the printed word set the stage for learning to read. For Samantha the journey started with her interest in letters and their sounds, and more specifically, her interest in how the mouth makes sounds. She was fascinated by how mouths would move to make sounds, happily watching my mouth, video clips and trying to move her own mouth into the shape of a sound. Though she rarely was able to reproduce the sound of a phoneme she often got close to making the right shape with her mouth. Samantha's interest in watching how mouths made sounds lead us to the free Small Talk Phonemes (and later the Small Talk Blends) app on her iPad. We spent many months matching letters printed on cards, letter manipulatives and letters written on a white board to the sounds that they make. Samantha played with letter sounds using manipulatives and playing games. 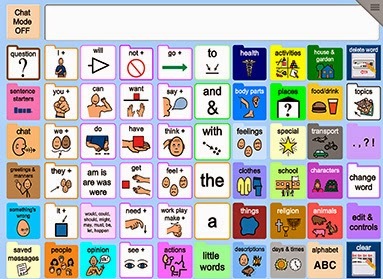 She did some "scribbling" with letters using the LiterAACy software program on her Tobii Communication Device. We also used a lot of music videos. You can find a music video for just about any phonics concept on YouTube. We used the Niki Play app to give us easy access to our favorite phonics and literacy music videos. Like most learners with apraxia, Samantha does not do well with on demand assessment so we surreptitiously assessed for the knowledge of one to two letter sounds per session. Mastery was assumed when she correctly matched the letter to the sound and vice versa just twice, allowing us to move forward and not cause boredom or anxiety with repeated testing. Once Samantha had mastered the letters and their sounds we began work on segmenting and blending words. Samantha's favorite way to do this was using a drawing of a slide for blending CVC words. This became a preferred activity and we worked through all the CVC word families on our letter slide. We also worked on tapping out words. This was somewhat more difficult as it was hard to find motivating ways to do a task that is usually so kinesthetic. 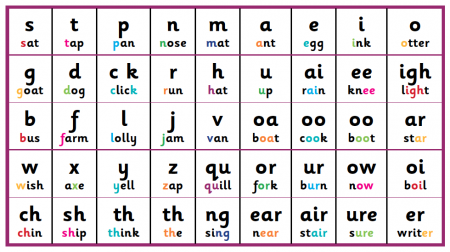 Now that Samantha had a grasp of all the basic phonemes and how to spell and read most CVC words, we began work on blends, double vowels and a variety of phonics rules. This continues to be a slow process. We work on these concepts as they present themselves. For instance, when Samantha spelled the word "blu" using an alternative pencil we began a journey learning about double vowels and specifically "ue". We watched music videos and an instructional video on YouTube. We looked at other words. I keep a list of phonics rules, digraphs, diphthongs and other information to check off as we work through these things at Samantha's pace based on her interest. It was Samantha who forced my hand on this. I didn't think she was ready. I was wrong. We had long been in a habit of me reading aloud text and discussing it or, if I needed data and Samantha was in the mood, having her answer questions. One day I prepared to do such an activity. She became irritated with me as I choose the harder flashcards designed to work on reading for main idea out of the box. Using facial expressions and banging her fist on her tray she made it clear she wanted to use the easier cards. I gave in. Then she told me with her Tobii, "Let me do it." So I took a chance, I held up the card and waited while she read. In the end she read three of those cards and answered the main idea question correctly each time. You can see the video on the post "Sam is Reading." She has done this numerous times since and we have started to offer her more and more chances to read text on her own. We have been setting up books on Bookshare with the Voice Dream Reader app set to a slower playback speed so she can read on her own. She has been known to swipe the iPad to her Bookshare book when someone comes along and switches her to a picture book instead! We are experimenting with new ways for her to use technology to access text to read on her own, for meaning. I think the sky may be the limit. Note: Obviously I am not the only one who has been on this journey with Samantha. 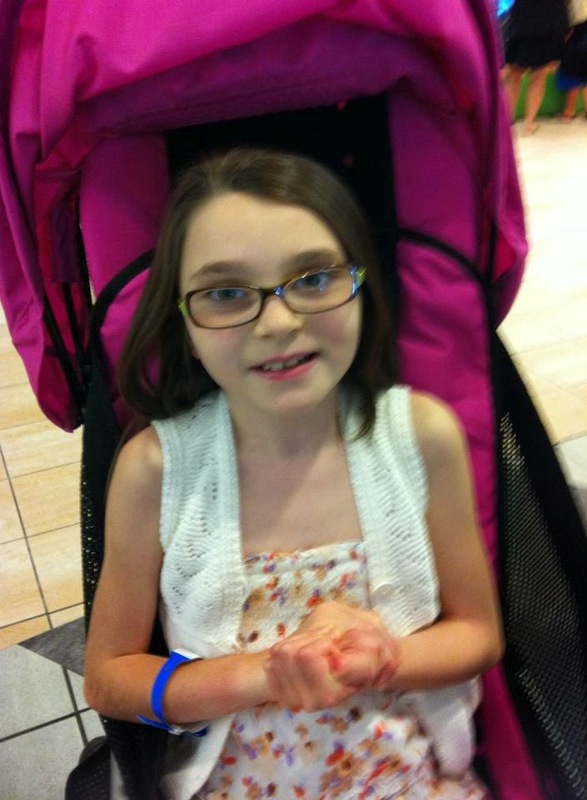 Her parents, siblings, PCAs, nurses, teachers and therapists have also been part of this adventure. This is just my view of the story. Many people played a role. "Make a choice, Make it your voice!" 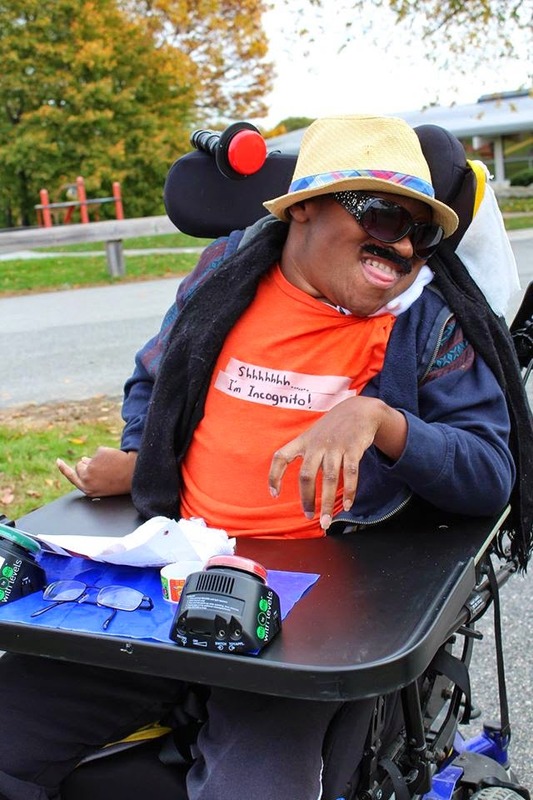 Over the past five years there has been a huge upsurge in postings about awesome Halloween costumes for children and teens (and adults) who use wheelchairs. On Pinterest and other social media you can find hundreds of example of amazing and clever costumes that see the wheelchair as just part of who the child is. Yet as I looked through my feeds yesterday on Twitter, Facebook, Pinterest and other social sharing sites yesterday and today I saw almost NO pictures of children who's AAC systems or devices were even in use, forget included as part of custom design. I do, definitely, want to applaud those pictures I did see of children and adults using AAC in costume. Here are a few of them (thanks to the parents who gave permission). Nice job! I know some families may have moved systems out of the way for pictures. I know other families struggle with the challenge of high tech devices being too cumbersome or heavy to bring trick or treating. Which is, of course, why all our high tech AAC users should have back up low tech systems! And just to be clear, it is on us, as professionals, to find a way to help families in making sure AAC is always available. As teachers we can start to make that happen for next Halloween right now! Let's dedicate ourselves to 1) full time AAC for all our non-speaking/low intelligibility students 2) back up low tech systems for all our high tech users 3) training families on how to integrate AAC into daily life and special events! We alone, as those who teach and love AAC users, are able to support AAC all the time! Even on Halloween. 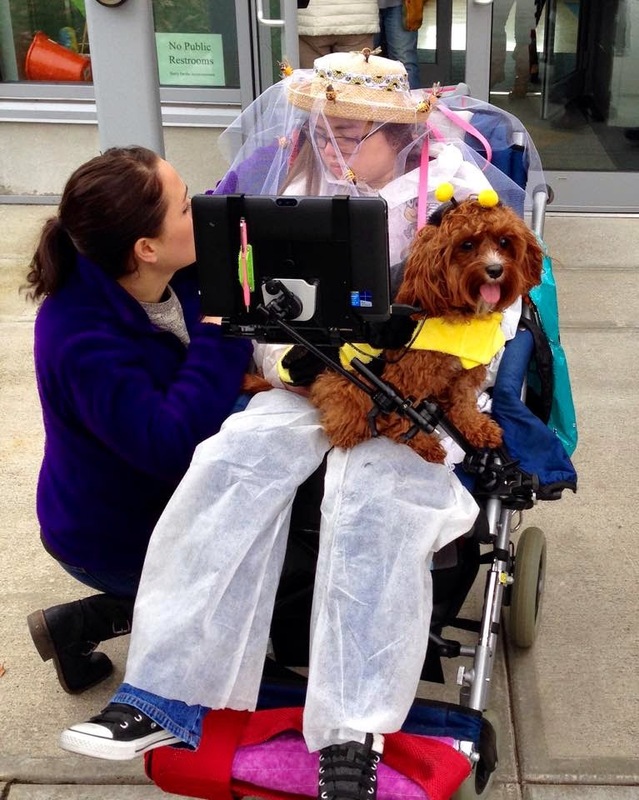 We need to start now to make sure next year pictures of AAC users in amazing AAC incorporating Halloween costumes flood the internet! And so I announce the 2015 Communicators Costume Contest! Write it in your calendars! On November 1st, 2015, at Noon, I will be posting the picture and giving away and amazing prize to AAC user with the best costume that incorporates AAC into the costume! Make your device the control panel of your airplane! Disguise your PODD book as a shield! Carry your iPad with Proloquo2Go as Snow White's mirror! Be creative! Let's get AAC out there!